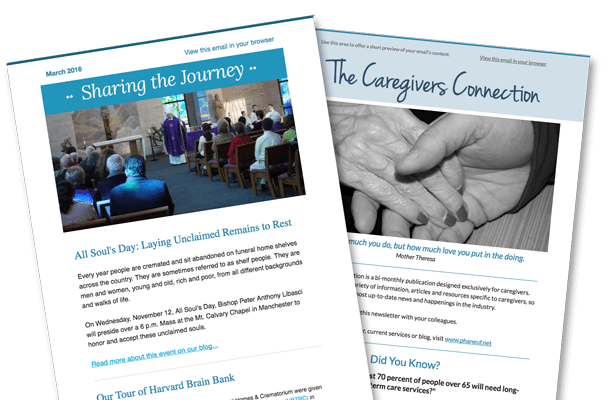 Phaneuf Funeral Homes & Crematorium regularly publishes two newsletters, which contain resources, news and information for two different audiences. Please read about the newsletters below and subscribe to the one that you feel best fits your needs. In our bi-monthly consumer-facing email, we cover upcoming events, resource information for families either facing a loss, or dealing with one, and things you should know and understand as you engage with the death-care industry. This quarterly email is created specifically for caregivers in the death-care industry. The newsletter includes a variety of information, articles and resources specific to caregivers and helping them to serve their client families. Subscribers will learn about the most up-to-date news and happenings in the industry.